The early Celtic Christians had a term for the Holy Spirit which, at first seems laughable, but when one goes deeper is actually quite intriguing. They called the Holy Spirit the Wild Goose. What would it be like to pursue the work of the Holy Spirit in the same way one might go on a wild goose chase? How much more exciting the Christian life would be if I chased after the movement of God's spirit the way I might go on a wild goose chase! As I'm slowly working my way out of Matthew chapters 5-7, I've spilling over into Acts. It seems that God is teaching me much about the role of the Holy Spirit lately, which I will blog about over the next several days. As I'm reading Acts I've been challenged by a church planter down in the city with this question: "What is the Spirit's intentions with the Church?" After my meeting with Sam and Mohammed I had lunch with my good friend Todd, a pastor-friend of mine at (where else) Chipotle and told him about my morning. In the middle of my steak burrito I received a call from someone regarding a rental facility we had agreed to in principle. But this person gave me some bad news: the location we had agreed to rent (good price, good space and ten minutes from downtown Lansdale) had fallen through. We had it all lined up and we were told we would no longer have the option to meet there. I was not only disappointed, but I was stressed: I now had six days to figure out where our team was going to meet, despite feeling as though I had exhausted all the options in the previous month of calling and looking around. Originally, we anticipated that our launch team for Renew would be about 15-20 people meeting in a living room for the next several months praying and talking, worshiping and dreaming. But when it was all said and done, we had a launch team that was much larger than what we thought, a size which would be impossible to accommodate in a living room, no matter how big the house. It is an issue to find space, but a good problem to have for sure. So for the past several weeks I had checked everywhere for a location space to rent once a week for the next several months.I checked several places. I checked at the YMCA. The Boys and Girls Club. And all of them were dead ends. So the phone call was not bad news (i.e. the one place we had found that could accommodate us actually would not work after all) was really bad news. Deeply disappointed, I hung up the phone and asked Todd what he would do if he were in my shoes. As we were talking, it dawned on me: I remembered seeing place before as I had been driving around and doing prayer walks. I wondered what was inside because it had a sign on the door that said that musicians were to enter there, so I knew it had some sort of venue to accommodate some type of show. I asked him if he would join me for a quick trip to visit this place. "...and a church planter walk into a bar." The place I had remembered was, in fact, a bar. A bar that is two blocks from the Lansdale train station, on the same street as Nadia Thai Restaurant - at the corner of Third and Walnut. I had never been to this location before, but when we walked inside we realized that it was a rather large and spacious bar - but very smoky. But before we left, we asked the bartender about the history of the place and the story behind it. The building has a unique history: The building used to be a church, an old, historic church. The inside may look like a bar, but the outside looked like an old, traditional church - stone building, cupolas, high arching doors. It had a churchy feel to it. In fact, the bartender went on to tell us that the location was the first church the borough of Lasdale ever had! It's been around for over a hundred and fifty years, was sold to the Elks Club over 30 years ago and then bought by a guy in 1999 who turned it into a bar. The thought was staggering: the people in this old church had grown cold, insular, irrelevant and ingrown and had forgotten it's purpose of the Body of Christ, passion for evangelism and direction...and so it shut its doors and sold the building. I remember driving by the place a few months ago and thinking two things: this is really peculiar...and this is deeply saddening. The stained glass windows had been taken out and regular windows were installed with neon signs that said "Yeungling" and "Budweiser." Pews had been replaced with pool tables. The altar had been taken out to make way for the televisions broadcasting every sporting event on at any given hour. Justin Timberlake songs on karaoke had replaced old-time gospel hymns on the organ. And Blue Moon and Samuel Adams replaced the communion elements of bread and wine. The people of God has been replaced with the people who truly needed God. The bartender called over the owner and introduced us to each other. Then the owner gave us a tour of his place. Of course, we could see that it was a bar on the first level, but what we didn't realize was that there was an upstairs, the old fellowship hall - and its a rather large fellowship hall. The owner told us that he rents out the space for dinners, bingo activities, events, banquets, wedding receptions, affairs and music shows. It has a large dance hall/floor area - it includes a sound system, a portable stage, round tables and a few hundred chairs, a disco ball...and (why not?) a neon Red Bull Energy Drink sign. Downstairs it has a eating area separate from the bar area that could be used for the kids on the launch team. The upstairs fellowship hall and the downstairs eating area had a different entrance from the bar entrance around the side. Todd turned to me and said, "I am a bit jealous. We love our space where we are at, but if this place were in my area I would meet in this place." He then said, "You would be foolish not to meet here with your launch team." It seems to make so much sense, especially with the vision that we believe God has given us for Renew. It's not just Todd and I that are thrilled. Megan thinks its a great fit. And the Board of Directors for Renew thinks its completely in line with our vision. Here's why we're so excited about it and see if as being incredibly strategic and ideal for our context. (1) It perfectly fits the mission of Renew. We have said from the beginning that the vision of Renew is to connect with the spiritually disconnected. As we have stated many times, we want to live by the mantra that "we are here for people who are not here." We said that Renew needs to be a place for skeptics and dreamers, a place that is comfortable for people who are cynical and skeptical of church and who even find Christianity offensive. A place that is more concerned with the de-churched and the unchurched, than the overly churched. Most bars are filled with cynics and skeptics who don't believe that Christianity is irrelevant, out of touch, foolish or has anything to offer them personally. We can think of no better place to rent than a place than a place with people who are desperately in need of Jesus. Instead of running from it, we want to confront it up front and close. What kind of church meets at a bar? Because we believe that this is where Jesus would be. And we strongly believe that the best place to find those who Renew is trying to connect with - the skeptics and cynics, the de-churched and the unchurched - would be found in a place like this. The building - and the people who hang out here - will keep us on our mission, constantly reminding us of the words of Jesus, "It is not the healthy who need a doctor, but the sick." (In fact, if you have a moment, crack open your bible and read Matthew 9:9-13 about the party that Jesus attended). Jesus hung around in some pretty interesting places - so much so that he was accused to getting drunk and eating way too much (Mt 11:19; Mt 24:49 and Lk 7:34). If we're living like Jesus we will connect with those who feel like they don't belong in church and we might actually begin to receive the same kind of comments that Jesus did - religious people complaining that we are hanging out in unique places. (2) It fits our name perfectly. When I took my pastor-friend through he said, "dude: think about the name of your church and this location and how perfectly it fits... Your name is Renew because you want to people renewed through the gospel and the work of the Spirit. But think about this building: you guys want to be a church that meets in a bar that used to be a church!" If we searched high and low for the next 10 years in the area we might not find a better place for a church called Renew to meet than at a bar...that used to be a church - the first church in Lansdale. (3) It will be a valuable tool and teacher. Some of us did not come from faith traditions where hanging out in a bar is "normal." For some of us, this will stretch our minds to think about "church" being in a bar. But it will help us (me included) over the next several months to unlearn some aspects of what we expect "church" to be. It will remind us that we are not trying to be a "normal" or traditional church (there are enough of those in the area already doing good things) but to bring fresh expressions and fresh extensions of the kingdom of God. We feel as though this is fresh and unique - something the area desperately needs. It will put us in contact with people who are different from us and will allow us to hear their stories. It will open our eyes to see needs we would never see if we were meeting the original location we had lined up. It will show us a unique side of Lansdale we might never have seen. It will force us to grapple with the power of the gospel, prompting the question, "Is the gospel powerful enough to transform the lives of even these people?" These are all good things for us to be wrestling with, as we will see that it is Jesus who came for the least, the last, the lost, the broken and those that feel left out and irreligious. How long will we be at this location? Who knows. But while we're there, we feel as though the locale and its people have much to teach us. (4) It has already provided fruitful opportunities to talk about Jesus. When we first walked in the bar we had no idea what we were getting into, nor did we know that they rented an upstairs area. On the tour the bar owner asked me what type of organization we were. I told him we were an organization that was called Renew because we wanted to renew the borough and the region physically, emotionally, mentally and spiritually in the name of Jesus. Some would call us a church but we see ourselves as much bigger than that. I took someone else on Monday night to see the place to see what they thought of it. That night met a guy named John in the bar area who told us more about the place and we told him about Renew. He, too, said that he would have to come check us out: a church that wouldn't despise or even just tolerate, but would welcome the opportunity to meet in a bar - he told us he would have to come to that. I met with another borough leader a few weeks ago and told him Renew was going to be meeting at the bar. He was intrigued that we would want to do something like this and commented, "Wow...this is a kind of church I have never seen before and this is a facet of Christianity I did not know existed." When people with admittedly little or no church background are telling us that they are intrigued by what we are doing and feel compelled to come check out what we are doing I think we're on to something significant when it comes to reaching those in the region who are far from God. We do this so that those who are spiritually disconnected - those on the fringes who don't feel as though they have a place at the banquet table, can experience the saving grace and love of Christ. We do this to see people experience life to the fullest measure offered through the life, death and resurrection of Jesus. (5) We desperately need the space! While disappointed and stressed by the phone call at lunch that day, God orchestrated this place, a place that I had driven by and walked past many times. From the time I hung up the phone at lunch to the time we had secured the space above the bar it was just over a hour... Talk about God's timing! Ironically, I had prayed for this building very specifically and out loud a few weeks prior on a prayer walk with two other members of our launch team. I prayed that if that was even a remote possibility for us to be in that building that God would orchestrate it to be a good fit. Little did we know what God had in store. "If 'church' is what happens when people encounter the Risen Jesus and commit themselves to sustaining and deepening that encounter in their encounter with each other, there is plenty of theological room for diversity of rhythm and style, so long as we have ways of identifying the same living Christ at the heart of every expression of Christian life in common." So, for the past month our launch team has been meeting at this location. A stretch for some of us, to be sure, but we all have the conviction that this is the right place for us to be meeting. And we can't think of a better place to gather. [Sidenote: Before I close I want to speak very briefly to those who might have a difficult time knowing that a church would be meeting in such a non-traditional and "interesting" place as a bar. I feel no need whatsoever to defend ourselves, but because we are all on different places on our journey and in our convictions, let me speak to this specifically so as to to be as clear as possible. Above I've tried to explain the correct reasons we are meeting at our location. Let me share what the incorrect reasons are. These are not the reasons we are meeting in a bar. We are doing this to be controversial and cause a stir. This is not the reason we're doing this at all. We believe it fits in line with our vision, putting us in the proximity of the people that need the gospel the most. And this excites us. We believe that drunkenness and abusing alcohol is alright. Scripture is extremely clear that being drunk - being controlled by anything other than the Spirit of God - is in direct violation of our bodies - the temple of God's spirit. We do not condone drunkenness in any way. In fact, we hope that our presence at this location will help to see lives transformed and those who attempt to find hope in alcohol would instead find it in the story of the gospel and the life of Jesus. We are just trying to be a cool and hip church. We are not trying to be a hip and cool church, but a faithful one made up of broken people who are honestly seeking God and how he wants us to participate in where he is already working. That's all he asks of us. We are not wanting anyone to think, "Oh, they are just selling out to the culture so they can fit in and look like they are doing something radical." The truth of that matter is that we were desperate for space and God provided us a terrific place. We believe that we can best live out the mission of what we are called to do - be a light to the darkness - better here than almost any place else. We are trying to force everyone that has the conviction not to drink alcohol to change their convictions. Whether you believe that drinking is something a Christian has the freedom to do or not is not the issue (and we're not going to get into it here). But as followers of Jesus who read and study our Bibles we all have to agree that Jesus himself hung out in some places that made certain religious people nervous. He did it not to be controversial, but to bring light in the dark places. We fully believe that if he lived here in 2008 in Lansdale he would be hanging out with these types of people, loving them, caring for them and showing compassion to them on their terms. Jesus' strategy was simply: meet people where they were at and take them to where they need to be. Living missionally is a "we go to them" mindset, not a "they come to us" mindset. We think that traditional church buildings are bad. Not at all. Buildings are important (but should be kept at an appropriate priority level). Buildings allow us to fulfill ministry. Church buildings are not bad, but they must serve the mission for which we are called to. And we believe the building we are renting falls in line with the vision we're called to live out. 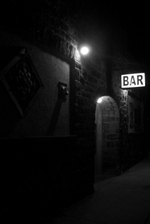 We want to have our identity be solely wrapped up in us being a "Bar Church." We feel our current location is unique, but we certainly are not trying to be known in the area as that. We hope we wouldn't be known for our location, but for our love. We desire to have people know us as that faith community that represents Jesus clearly and compellingly. Lunch at Chipotle with a friend. The location of Third and Walnut in downtown Lansdale. A Hindu, a Muslim and a church planter walk into a bar. And all that happened before 3 pm. After meeting with Sam I hustled over to the North Penn Mosque to meet with the imam of the mosque, Mohammed Ali (no, not that one). An imam in Islam is the equivalent to a priest in the Catholic church or a rabbi at a synagogue or a pastor in a Protestant church. Mohammed and I had a wonderful conversation. He gave me a tour of the mosque (shoes off, please) and told me about the weekly activities that take place through the building. I asked him questions about where he is from (Bangladesh), his family (who still live in South Africa), how long he had been in Lansdale (four years) and how he ended up there (long story). I asked him about the basic tenets of Islam and how that works in the context of being in the North Penn district. I asked him about Lansdale and what he finds pleasant and difficult being a minority in the region. We talked about the discrimination he and the mosque sometimes experience and the backlash of starting the mosque right after the attacks of September 11. He even gave me some books to read on the basics of Islam and how Muslims practice their faith. I found him to be a very pleasant, humble, generous and trusting man who was willing to answer any question I had. He even invited me back for further conversation in the future. I told Mohammed when I left: "While we differ significantly on our understanding of God and our view of the world, I still want to continue to build a relationship with you. Let me know if there are ways in which Renew could serve you and the people who pray at the mosque." I even invited him to come over to our house for dinner in the near future. He was very grateful for the invitation. They say that church planting is a wild ride. Two weeks ago I had a pretty interesting day of ministry. When I got home Megan asked me "So, how was your day today?" I paused for a moment and then I responded by saying, "A Hindu, a Muslim and a church planter walked into a bar. That pretty much sums up my day." I'll be unpacking that statement - and my day - on the blog over the next few days. My day started in Lansdale by swinging by the post office to pick up the mail at the Renew mail box. Afterwards, I swung by the public library just down the block to pop in and say hi to a new-found friend named Sam. Sam is in his late-twenties, a medical student from India who was raised in a Hindu family. He moved to Lansdale to live with his aunt after completing medical school in northern India and is spending the next several months studying for his medical board exams. He spends six days a week studying in the library from the time it opens to the time it closes. I had bumped into Sam a few weeks back in the library and had a fascinating conversation. During that first meeting I asked him what he was studying and where he was a student. He then asked me what I did. "I am a practical and educational theologist.," I responded. "What's that? I have never heard of such a job." "Well, my job is that I help people be attentive to God and then respond appropriately." "There is a job out there like that?" "Yeah, I teach and help people live out the ways of Jesus in their everyday lives. We also started an organization recently called Renew. The goal is that we renew Lansdale and the region physically, emotionally, mentally and spiritually - in the name of Jesus." "I had no idea that there was such an organization." He asked me questions about Jesus and why we would be doing such a thing. I went on to tell him about Jesus and what he had done in my life - and the lives of many others - and how it compelled us to live lives that reflected the character and nature and priorities of Jesus. He was absolutely fascinated and asked if we could get together some time and hang out because he had more questions about Jesus and what I was talking about. I told him I would love to hang out. Because I knew that Sam had questions and I knew he would be studying there since he does all the time I popped in to say hi and tell him that I had been thinking about him and wondered how his studying was going. Once again, Sam and I had a fascinating conversation about Jesus and church and what it means to be a follower of Jesus. Conversations like these ignite something deep within me. when i judge others i have little room to show compassion. when i am filled with compassion i have little room for judgment. how will i choose to live today? A few months ago a pastor-friend of mine introduced me to a new word I had never heard before: xenophobia. Break the word down in Greek. Xenophobia: fear of the stranger. Or, to word it better: the fear of someone who is different than me. Psychologists will tell you that we all have xenophobia to some level or another, whether its severe (racism, sexism, bigotry, etc), diagnosed (deep levels of paralyzing anxiety over people who dress a certain way, talk a certain way, look a certain way, etc) or mild (locking our car doors as we drive through dangerous neighborhoods late at night or avoiding our neighbors who are weird because they make us feel awkward and unsafe). We can spot xenophobia because what we fear the most is what we distance ourselves from the furthest., whether its physical, emotional, psychological or spiritual proximity. What we are closest to in proximity is what we love the most. I've wondered about my own xenophobia. What types of people am I afraid of interacting with? What - or who - do I hold at the furthest distance away from myself? What - or who - do I hold closely? As I've thought about my own xenophobia for quite some time I'm not entirely sure my answer, but I can tell you generally that I am fearful of people who don't make me feel safe. This is not uncommon. I think most people would answer the question this way. I've been wondering about xenophobia and the gospel. What are the implications of the gospel message when it comes to people who are different from us - religiously, socio-economically, geographically, linguistically, culturally - whether those people live across the street or across the world? I'm chewing on the inclusivity of the gospel, the role of the Church in the world and how they relate to our fears of those different from us. I think what made Jesus a compelling figure is because of the presence of love he had no xenophobia. The more xenophobia we possess, the less love we will possess. The more love we possess, the less xenophobia we will possess. The gospel's power is so strong that it is capable of breaking down every xenophobic wall that we could ever erect. Where is your xenophobia most evident? Why is that? And can I invite the Spirit to come in and break down my xenophobic tendencies in order to replace them with love? My earlier post on the Olympic athletes that I know made mention of my middle school and high school classmate Lindsay Shoop who was competing in Beijing in the eight-woman rowing events. Come to find out that Lindsay and the other seven women rowers took home gold today. Here's a picture (Lindsay is second from the left with both hands in the air). Also, Reid Priddy and the men's volleyball team continue to roll. I've been hanging out in Matthew chapters 5, 6 and 7 all summer long. I have immersed myself in the rich words of Jesus, the explanation of his rhythms and interpretations for how real life is lived called The Sermon on the Mount. In the midst of a summer of chaos, complexity and busyness, it has brought me back to the basics, reminded me of the foundational elements of following Jesus, the simplicity of faith. It's been challenging, refreshing, enlightening, frightening and encouraging. Probably the reason why I have stayed there and haven't been able to move on from it is because I have so much to learn from it and I am far from where I need to be to live out these values in my everyday, ordinary life. I've also been re-reading Dietrich Bonhoeffer's classic book The Cost of Discipleship, where he expounds on each saying of the Sermon on the Mount. It's rich and deep. My brain can only handle a few pages at a time before I have to put the book down in order to process it all. (If you've never read it, pick it up. It's worth its weigh in gold). Jesus opens his teaching on the new way of life by sharing that the kingdom of God is inclusive, open to a wide variety of types of people (5:1-12). I read over the list of values above and I'm struck with this profoundly simple thought: if I am to be a faithful follower of Jesus then these rhythms will be clearly evident in my own life. Consequently, I'm struck with this profoundly simple realization: I have a long way to go to have Christ fully shaped in the rhythms of my everyday activities, thoughts and behaviors. Recently I stumbled across this fascinating chart that deals with the stages of our faith journey. It takes a few minutes to process, but it's well worth your time. -What do you think about this chart? -Do you agree with all of it? -Can you identify where you are on the chart? your family members? friends? -What are the implications of this for spiritual formation?